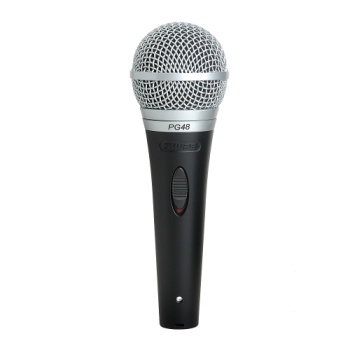 An excellent performance microphone for spoken word applications. Tailored frequency response is smooth and extended. Tuned specifically for vocal applications. Cardioid polar pattern picks up the most sound from in front of the microphone and some sound from the sides. Less susceptible to feedback in high volume settings. Dynamic cartridge has a simple, rugged coil. Handles extreme volume levels without distortion. Cartridge includes a neodymium magnet for high output level. Durable metal construction. On/off switch for onstage control. Steel mesh ball grille with integral "pop" filter reduces explosive breath sounds and wind noise. 1/4" cable included.